Defence Minister Nirmala Sitharaman had said the government cannot reveal the price at which it has bought Rafale fighter jets from France, due to its adherence to the Inter-Governmental Agreement inked for the purchase of the aircraft. However, Dassault Aviation, which manufactures Rafales, has in its annual report for 2016 stated that India has ordered 36 jets at a price of euro 7.5 billion, which is Rs 1,670.70 crore per fighter jet. As per the annual report, the contract with India led to the creation of a joint venture with the Reliance Group to manage the offsets. However, the government has maintained that the contract for offsets has not been finalised by the vendor so far. Coinciding with the visit of French President Emmanuel Macron, the Congress, which has been alleging a scam in the Rafale deal as finalised by Prime Minister Narendra Modi, referred to Dassault's annual report to emphasise its allegations. 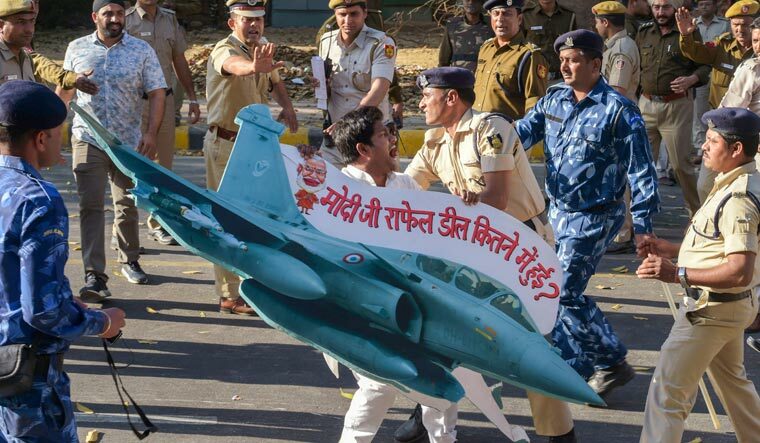 It said the fighter jet has been sold to India at a price that is Rs 350.90 crore higher per aircraft than what Egypt and Qatar paid for the aircraft just 11 months before Modi signed the Inter-Governmental Agreement for the purchase of 36 aircraft. Senior Congress leader Ghulam Nabi Azad, referring to the annual report for 2016 of Dassault Aviation, said 48 Rafale aircraft were sold to Egypt and Qatar in 2015—24 each to the two countries—for a total price of euro 7.9 billion, which works out to Rs 1,319.80 crore per aircraft. In September, 2016, as per the report, just 11 months after the sale of aircraft to Egypt and Qatar, 36 aircraft were sold to India for euro 7.5 billion, which is Rs 1,670.70 crore per fighter jet. “India is clearly paying Rs 350.90 crore more per aircraft or Rs 12,632 crore for 36 aircraft,” Azad said. He further said that the pricing of the Rafale fighters as per the bid finalised during the UPA government on December 12, 2012, was Rs 526.1 crore per aircraft as against the Modi government's per aircraft purchase price of Rs 1,670.70 crore. “There is a scam at two levels. The first is cancelling the deal finalised by the UPA government. And the second is finalising a deal that makes India pay Rs 350.90 crore more per jet compared with Egypt and Qatar after a gap of just 11 months,” Azad said. The Congress questioned the validity of the Inter-Governmental Agreement signed with France on September 23, 2016, since the object and purpose of the agreement was to ensure that India gets the lowest price of the aircraft in comparison with every other buyer. Randeep Surjewala, head, communications department of the AICC, accused Sitharaman of lying on the issue of finalising the offset contract for the aircraft. “The defence minister, through a press release, said no Indian offset partner for the 2016 deal for 36 Rafale aircraft has so far been selected by the vendor. However, the vendor, in its annual report, which came prior to the press release, specifies a joint venture with the Reliance Group to manage offsets,” he said. He asked why Reliance, with zero experience of manufacturing fighter aircraft, was chosen over the PSU Hindustan Aeronautics Limited. The Congress has been trying to corner the Modi government on the issue of corruption, and it has been alleging a scam in the Rafale deal. It has asked Modi to come clean on the allegations of corruption in the purchase of Rafales.